Hoosier Mama Pie Company in Chicago, where our friend Abra works and where Heather and I stopped in for a visit on New Years Day 2010, listed us as a friend/"pie fanatic" on their website, and tweeted about us. Sweetness! 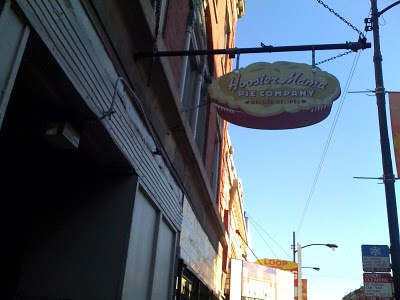 Chicagoans and Chicago visitors, don't miss Hoosier Mama for a delicious (not to mention massive) slice of fresh pie and cup of coffee in this adorable little West Town pie shop.